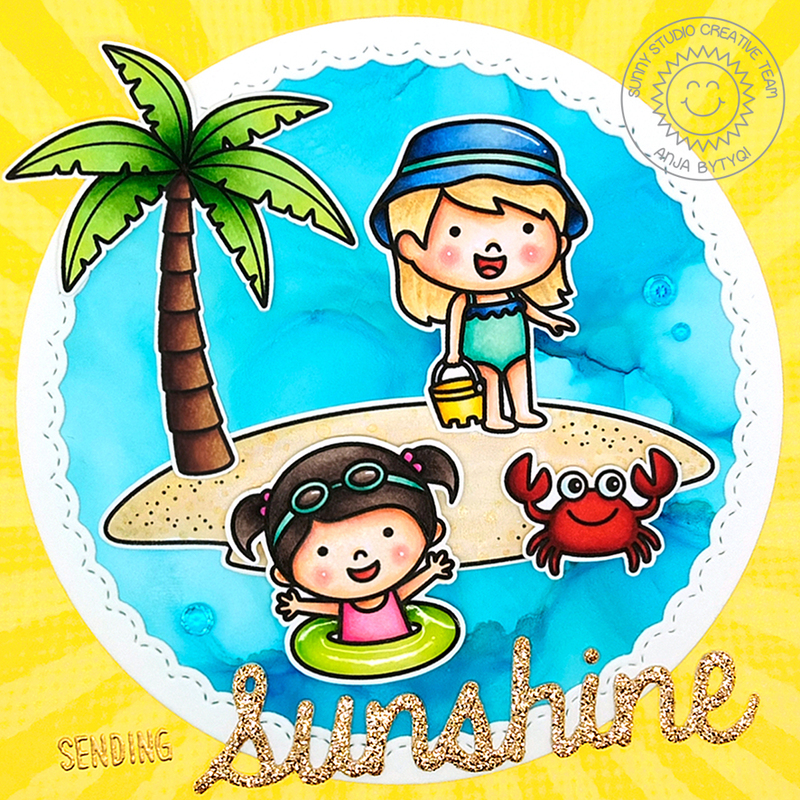 the Sunny Studio Stamps Summer Release went live last Friday and I'm delighted to share my first card using some of the new products. Today I'm showcasing the Coastal Cuties Stamps. The two girls included in this set are having so much fun in the sun! I created a square card and die cut the yellow sunburst paper from the Spring Sunburst 6x6 paper pack for my cheering background. For the water, I pulled out some Alcohol Inks in aqua and blue tones and die cut the Yupo paper with a circle die. Next, I die cut one of the Fancy Frame Circle Dies from white cardstock and adhered it on top of my Alcohol Ink circle. 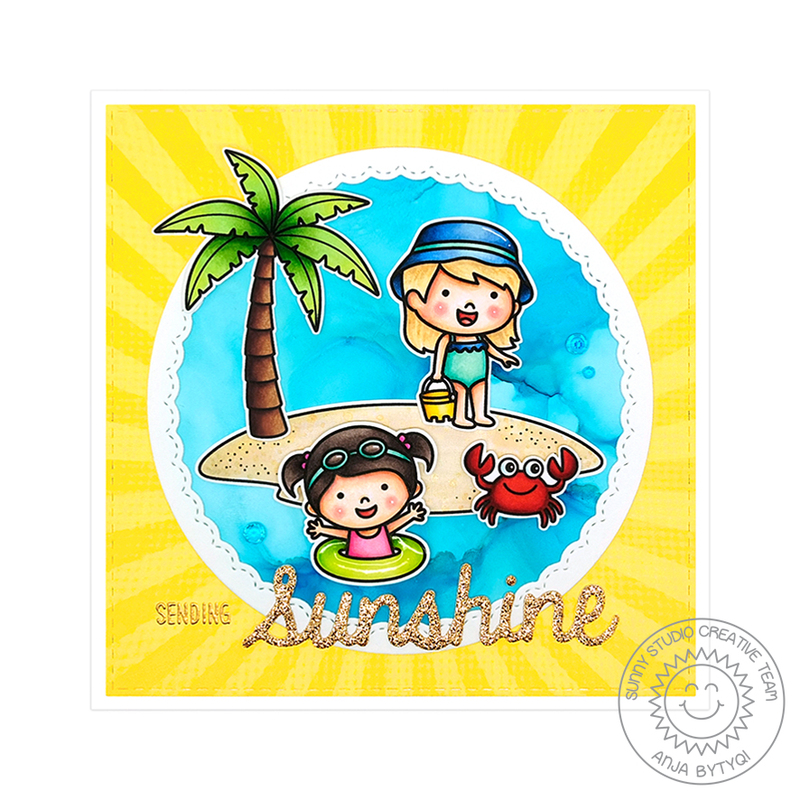 I stamped the girls as well as the palm tree (from the new Sending Sunshine set), island image (Island Getaway Stamps) and crab (Oceans of Joy Stamps) in Memento Tuxedo Black Ink and colored them with Copic Markers. I covered the girl's floating ring with Glossy Accents for some extra shine. For the sentiment, I combined the gold heat embossed word "Sending" and the Sunshine Word Die which I die cut from golden glitter cardstock. To finish off my summer card, I adhered three aqua jewels to the water. Thank you so much for stopping by! Hope to see you again next Thursday! today I'm sharing this Easter card over on the Hello Bluebird blog. 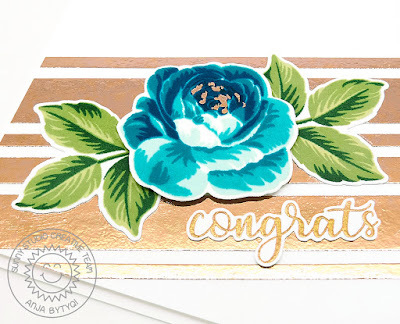 I combined the Spring Gatherings stamps, flowers and leaves from the Vertical Banner Die set and the Country Gingham Background. 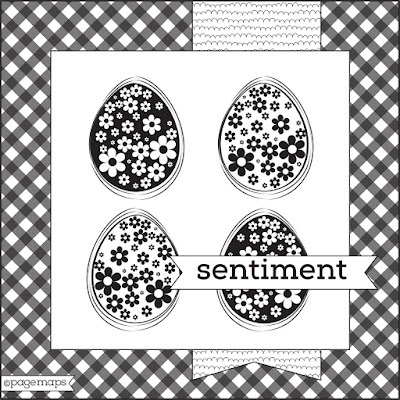 this week Sunny Studio Stamps is also partnering up with Becky Fleck over at PageMaps which is a great free sketch resource for scrapbookers and cardmakers. Each of us was provided with one of the April 2019 CardMaps sketches. I loved playing with the Chubby Bunny Stamps again – they are soo cute! The tulip and the heart are included in the Spring Greetings set. I stamped all images in Memento Tuxedo Black Ink and colored them with Copics. I used the coordinating dies to cut them out. 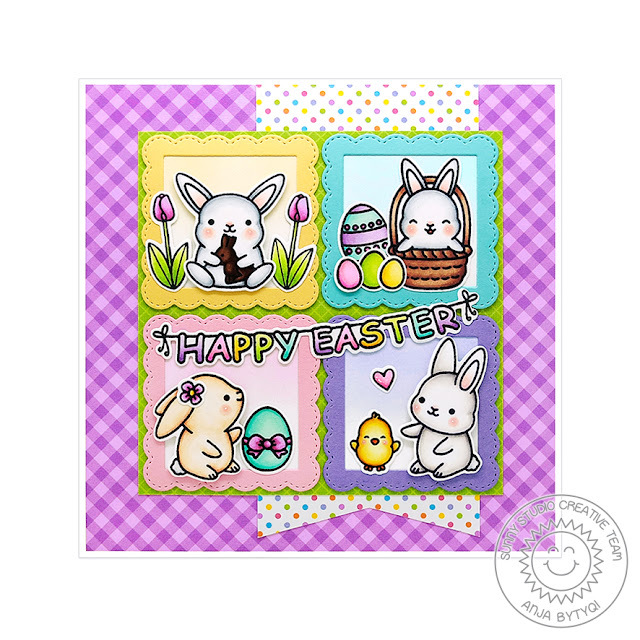 I created four little scenes for each bunny by die cutting the smallest of the Fancy Frames Square Dies from cardstock in spring colors. Behind the frames I put matching ink blended backgrounds which I made with Distress Oxide Inks. The patterned papers I used are from the Gingham Pastels 6x6 and the Spring Sunburst 6x6 paper packs. It was so much fun to use a sketch for the card layout – I haven't done this in ages! So thanks for having us, Becky! Thanks for stopping by! Have a relaxed Sunday! only two more weeks and it's Easter and this it what's all about this month at the Stempelgarten Challenge. 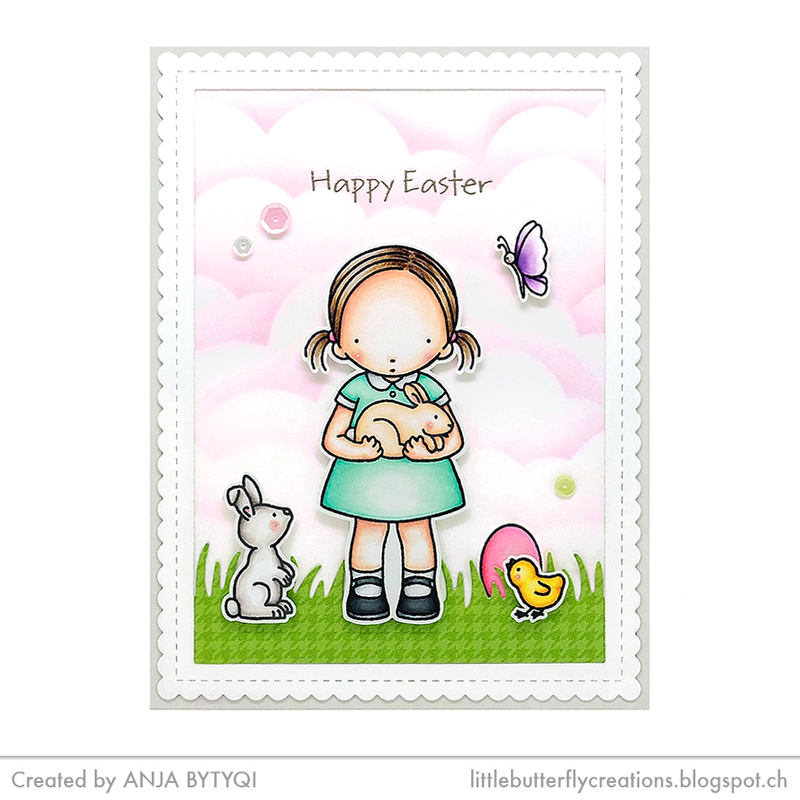 I combined two Pure Innocence stamp sets by My Favorite Things for my Easter card. 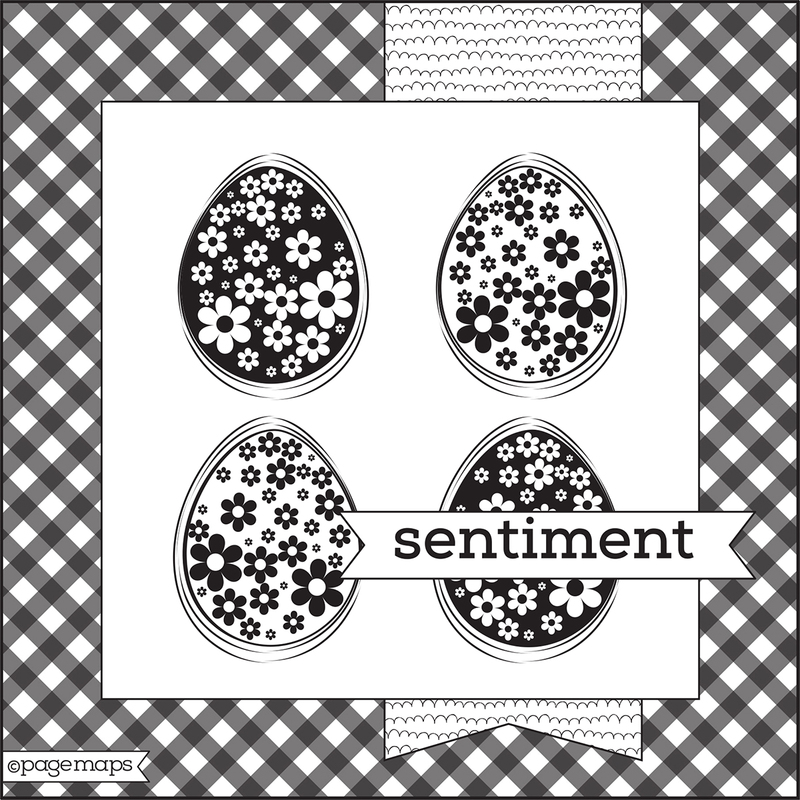 The girl, egg and sentiment are from the "Somebunny Sweet" set and the bunny, chick and butterfly are included in the "Spring Friends" set. All images were stamped in Memento "Tuxedo Black" ink and colored with Copics. For my little spring scene, I sponged some pink clouds using the MFT "Cloud Stencil" and "Worn Lipstick" Distress Oxide Ink. I die cut a grass border from patterned paper with the MFT "Grassy Edges" Die-namics. I framed the scene by combining the stitched scalloped die from the MFT "Blueprints 27" set and one of the "A2 Rectangle STAX Set 2" dies. I stamped the sentiment in VersaMark ink and heat embossed it with Ranger "Liquid Platinum" embossing powder. I finished off my card by adding some matching sequins. A craft package from the Stempelgarten Online Shop with a value of CHF 20.–. Thank you so much for stopping by! Have a great Friday! today I have the honor to be part of this week's product swap with Therm O Web. For the first time I tried Foiling with Deco Foil Transfer Sheets. I love the shine that it adds to the project, but it's not easy to capture in the photo. I used three widths of double-sided adhesive tape and adhered them at an angle on a panel of white cardstock leaving a gap inbetween each strip. Next, I cut a piece of "Rose Gold" foil to be slightly larger and put it on top of the exposed adhesive with the silver coated side facing down. I carefully rubbed my fingers over the strips to transfer the foil. So no heat or a laminator required. It's like magic when you peel off the foil. 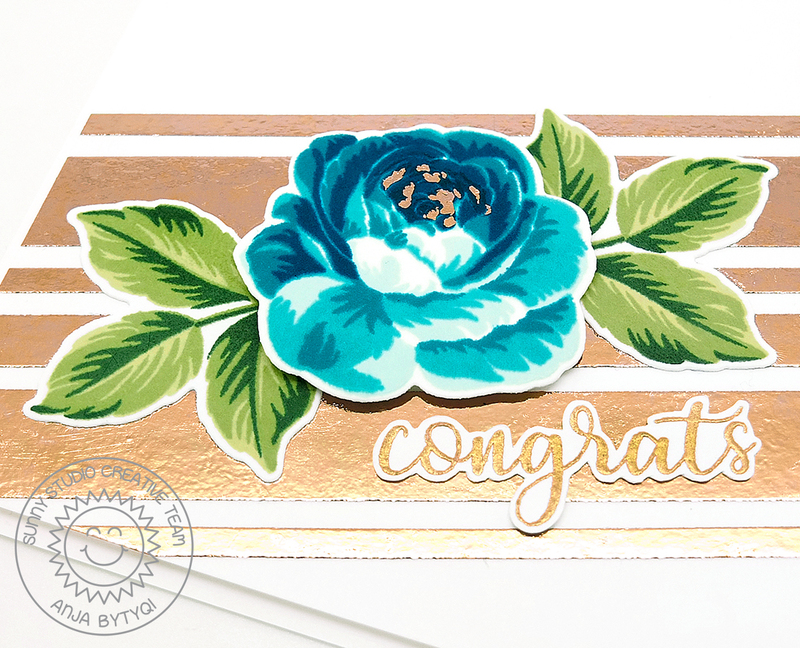 To create an elegant card, I inked up the Everything's Rosy Stamps again. I think the Teal (find the ink colors below) goes great with the Rose Gold. Instead of stamping the last layer with the darkest shade of ink, I applied foil using a bit of liquid glue. I used the coordinating Everything's Rosy Dies to cut out the rose and leaves. I love to use the Therm O Web "Purple Tape" to hold my dies in place while die cutting. It's removable, doesn't leave any adhesive residue behind and peels off easily without tearing the paper. Finally, I stamped the sentiment in VersaMark Ink and heat embossed it with gold embossing powder. Since there is no matching die, I fussy cut the word with scissors. Please have a look at all the gorgeous projects my team mates created with the Therm O Web projects this week. today on the Sunny Studio Stamps blog I'm sharing a card using the Frilly Frames Lattice Dies. 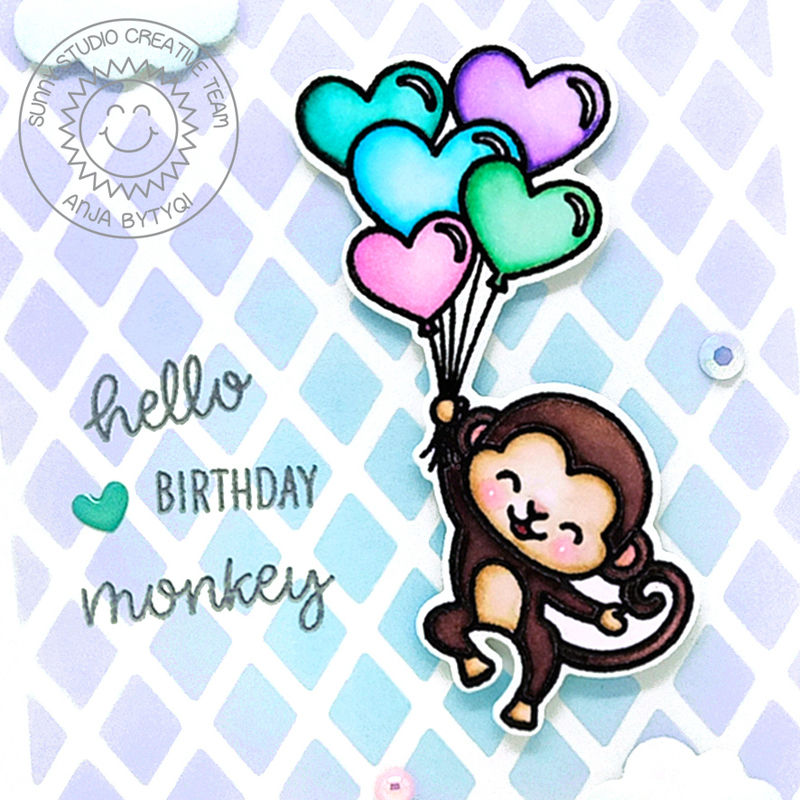 I adore the Love Monkey Stamps and had to make another card with one of these cuties. For my ink blended background, I created a stencil by die cutting the lattice background from copy paper. I temporarily adhered it over a panel of Bristol cardstock and used a blending brush for a soft look. The Distress Oxide Ink colors I chose are Shaded Lilac and Tumbled Glass. Next, I cut the background with the stitched scallop die to give it a decorative border. I stamped the monkey holding the heart balloons in VersaFine Onyx Black Ink and heat embossed it with clear embossing powder. I colored the image with ZIG Clean Color Real Brush Pens and cut it out with the coordinating die. To create my custom sentiment, I combined the 'hello' from the Foxy Christmas Stamps set with the other two words from the Love Monkey Stamps set. I stamped it in VersaMark Ink and heat embossed it with silver embossing powder. 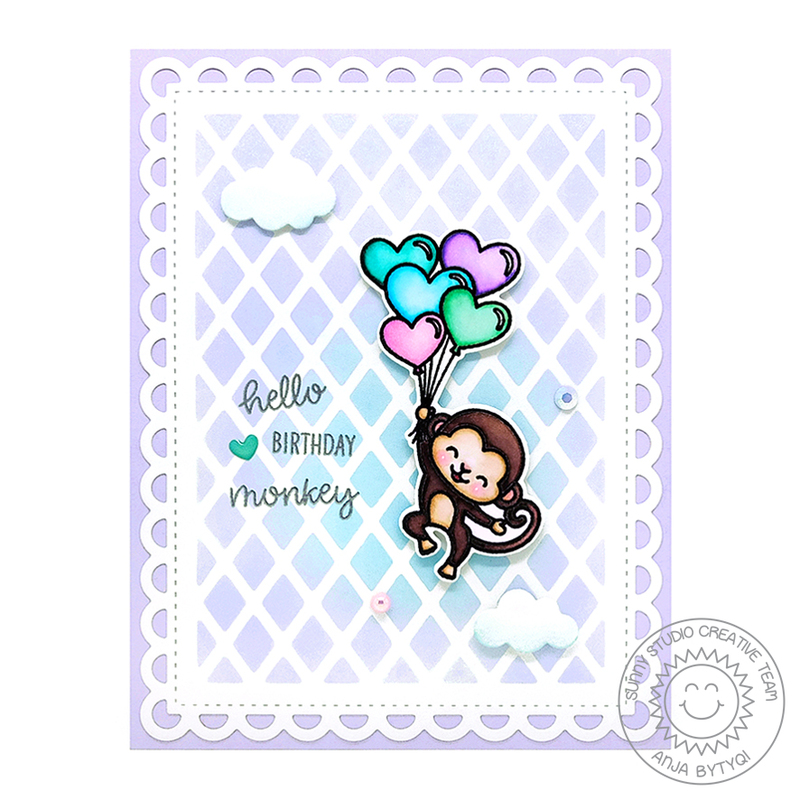 Since the little monkey looks like he is flying, I die cut two small clouds which are included in the Comic Strip Everyday Dies set. Finally, I popped up the monkey and clouds with foam tape and adhered some matching embellishments. it's getting warmer outside and I'm looking forward to spring, the fresh greenery and blooms everywhere and lots of sunshine. So I created this card with one of my favorite Hello Bluebird stamp sets called Bee Happy. Could this little fellow be any cuter?! I also stamped the strawberries and colored both images with Copics. I used the coordinating dies to cut them out. 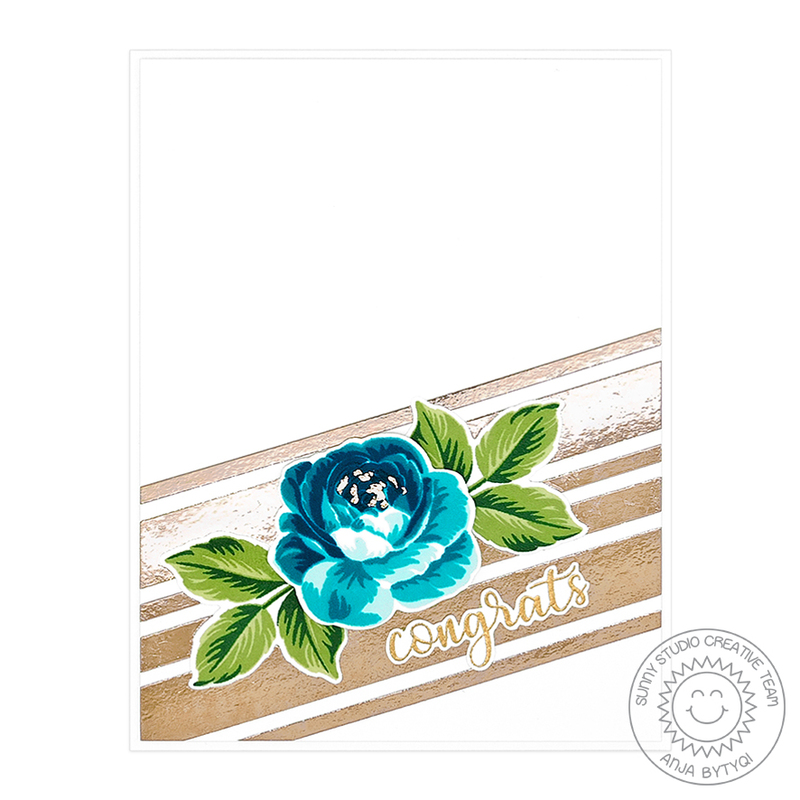 For the background, I did some stenciling with the Altenew "Watercolor Stripes Stencil" and "Spun Sugar" Distress Oxide Ink. I also added some white paint splatters. I white heat embossed the typed sentiment on a strip of dark grey cardstock and adhered everything with foam tape. Finally, I embellished my card with self-made shiny drops. Thank you so much for stopping by! Hope you're having a happy day!